Is your house an open invitation? The latest Christmas crime prevention campaign from South Yorkshire Police has been launched this week with the overall message of “don’t make it easy”. This refers to the way many people are too complacent to the risk of burglary and theft. 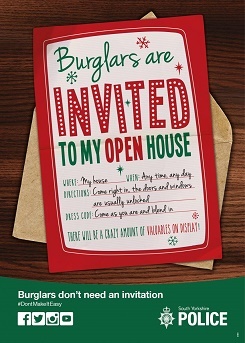 The burglary element of the campaign features an invitation to an open house for burglars because all too often people do make it easy by failing to lock their doors and windows. As many as 30% of burglaries are conducted in this way. Christmas is a particularly risky time for burglaries as the longer nights offer extra cover for burglars and there are, of course, rich pickings to be had with Christmas presents being bought ready for the big day. Just consider, of all the people you do want to invite into your home this Christmas, burglars are not among them. See the full campaign from South Yorkshire Police here. next Win a free burglar alarm and installation!